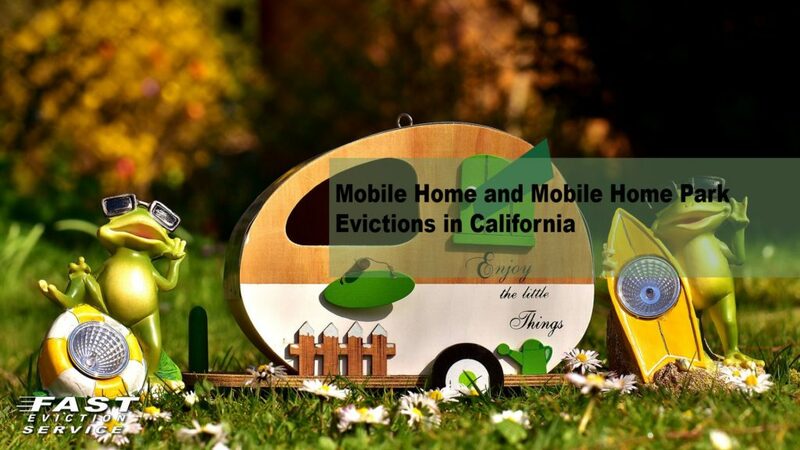 Whether you are an owner of a California mobile home who rents the mobile home out to tenants, or the owner/operator of a mobile home park that owns the mobile home and rents that mobile home out, there are some very important distinctions in California Law regarding mobile home tenancy and mobile home ownership that landlords and attorneys need to understand because they tend to make more mistakes with these types of eviction cases than with any other. A mobile home eviction does not have to be difficult if you understand a few basic rules. First, determine if the party bringing the lawsuit is the owner of the mobile home or a tenant leasing or sub-leasing the mobile home. Second, determine what type of notice you will need to serve before you can terminate the rental agreement. Third, determine if the person you are evicting owns the mobile home or is simply a lessee or sub-lessee. The reason why it is important to determine who is bringing the Unlawful Detainer action and who is the Defendant is that the California Mobile Home Residency Law (MRL) applies only to “homeowner” tenancies. In other words, the mobile home owner’s rental of a specific site on which the mobile home is installed, including the right to utilize the mobile home park common facilities and services. As to other tenancies in the park that are not mobile home owners but may be leasing or sub-leasing, normal California eviction termination rules apply. Here we become a bit more legalistic in this article citing the specific California Civil Code Sections because it is very important for your eviction case to proceed correctly to the letter of the law without making expensive mistakes. “(a) The Legislature finds and declares that, because of the high cost of moving mobile homes, the potential for damage resulting therefrom, the requirements relating to the installation of mobile homes, and the cost of landscaping or lot preparation, it is necessary that the owners of mobile homes occupied within mobile home parks be provided with the unique protection from actual or constructive eviction afforded by the provisions of this chapter. (b)(1) The management may not terminate or refuse to renew a tenancy, except for a reason specified in this article and upon the giving of written notice to the homeowner, in the manner prescribed by Section 1162 of the Code of Civil Procedure, to sell or remove, at the homeowner’s election, the mobile home from the park within a period of not less than 60 days, which period shall be specified in the notice. A copy of this notice shall be sent to the legal owner, as defined in Section 18005.8 of the Health and Safety Code, each junior lienholder, as defined in Section 18005.3 of the Health and Safety Code, and the registered owner of the mobile home, if other than the homeowner, by United States mail within 10 days after notice to the homeowner. The copy may be sent by regular mail or by certified or registered mail with return receipt requested, at the option of the management. A tenancy shall be terminated by the management only for one or more of the following reasons (1) Nonpayment of rent, utility charges, or reasonable incidental service charges; provided that the amount due has been unpaid for a period of at least five days from its due date, and provided that the homeowner shall be given a three-day written notice after that five-day period to pay the amount due or vacate the tenancy. For purposes of this subdivision, the five-day period does not include the date the payment is due. The three-day written notice shall be given to the homeowner in the manner prescribed by Section 1162 of the Code of Civil Procedure. A copy of this notice shall be sent to the persons or entities specified in subdivision (b) of Section 798.55 within 10 days after notice is delivered to the homeowner. If the homeowner cures the default, the notice need not be sent. This notice may be given at the same time as the 3-Day Notice to Perform Covenant or Quit or failure to pay late fees, and/or other charges and a 60 days’ notice required for termination of the tenancy. This commonly referred to as a 30/60 Day Notice. One very important difference in a California mobile home eviction from other types of eviction is that it is covered by the Mobile Home Residency Law or MRS. Mobile home evictions are not difficult but require an experienced Unlawful Detainer attorney who understands the complexity of the case and what is required under the California Mobile Home Residency Law to avoid expensive mistakes that happen far too often in this type of eviction case.